But it’s probably not his fault. Brett Kavanaugh, President Donald Trump’s new nominee to the Supreme Court, has been on the national stage for all of nine days, and the early reviews aren’t great: Polls show Kavanaugh as one of the most unpopular Supreme Court nominees in recent history. The traditional way pollsters test support for a Supreme Court nominee is this: “Do you think the Senate should vote to confirm [name] to the Supreme Court?” At least three high-quality pollsters have asked a version of this question for Kavanaugh already — enough to start taking the data seriously. According to a Fox News poll conducted July 9-11, 38 percent of registered voters said they would vote to confirm Kavanaugh; 32 percent said they would vote against him. That +6 “net confirmation rating” is the second-worst initial score1 out of the seven Supreme Court nominees Fox News has polled.2 Only Harriet Miers, whose appointment to the court by George W. Bush was withdrawn, fared worse, with a +5 score. According to a Gallup poll taken July 10-15, 41 percent of U.S. adults want to see the Senate vote in favor of Kavanaugh, while 37 percent want him voted down. On Gallup’s “initial reads” of 10 Supreme Court candidates since Robert Bork,3 only two came close to having such a low score: Bork, who was the rare nominee to lose a confirmation vote outright, and Miers. Miers had a +8 net confirmation rating; Bork’s was +6; Kavanaugh sits at +4. And according to a Pew Research Center poll conducted July 11-15, 41 percent of adults said Kavanaugh should be confirmed, compared with 36 percent who said he shouldn’t be. His +5 net confirmation rating is the lowest of the past eight nominees beginning with John Roberts, including Miers. You may be sensing a pattern. It’s not a huge sample size, but in the last few decades at least, Supreme Court nominees as unpopular as Kavanaugh have never been successfully confirmed. 2018 Brett Kavanaugh +5 ? *Average net share of respondents saying the nominee should be confirmed by the Senate among the first polls of the nominee by Fox News, Pew Research Center and Gallup. For Ginsburg, Thomas and Bork, there was data only from Gallup; for Garland, there was data only from Gallup and Pew. There was no polling data for Stephen Breyer, Anthony Kennedy and David Souter. But don’t get your hopes up, Democrats. First of all, this doesn’t mean that nominees struggle to be confirmed because they are unpopular; they could just as easily be unpopular because they possess other qualities that can derail a confirmation. Miers was generally seen as underqualified; Bork was rejected for being too conservative. Indeed, the X-factor here is partisanship. The chamber that vetoed Bork was controlled by Democrats, 55-45. The Senate Kavanaugh faces has a 51-49 Republican majority.4 In 2005, Republicans controlled the Senate 55-45, but it was actually opposition from within her own party that torpedoed Miers. That’s unlikely to be the case with Kavanaugh. A person’s opinion on a Supreme Court nominee has always hinged on his or her political party to some extent, but the Kavanaugh nomination has set a new standard for polarization. Pew found that Republicans and Republican leaners support his confirmation 73 percent to 9 percent, but Democrats and Democratic leaners oppose it 63 percent to 16 percent. 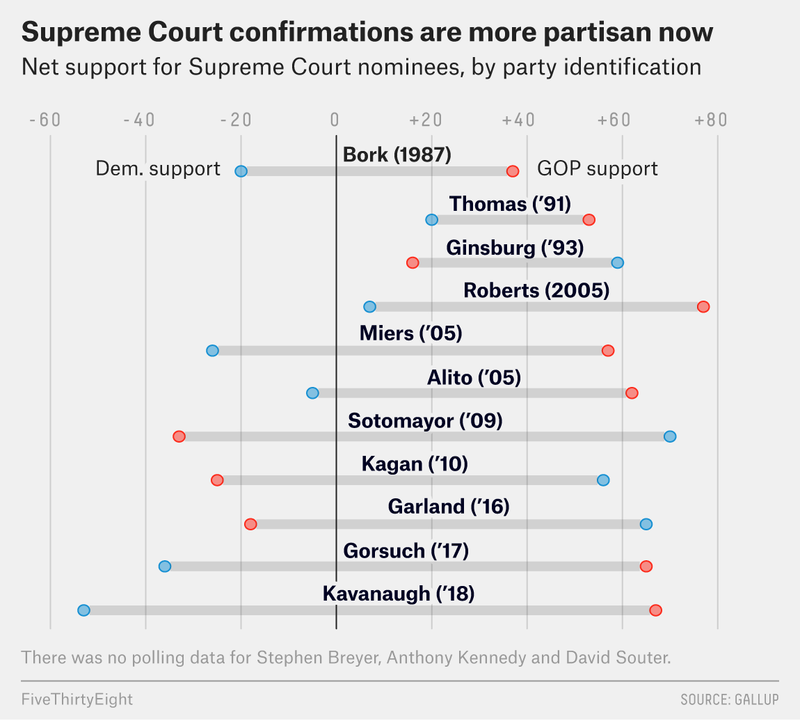 That gap between Republican support for Kavanaugh and Democratic support for Kavanaugh, 57 percentage points, is wider than for any nominee since Roberts. Moreover, the gap has widened over time: Neil Gorsuch last year had the second-widest gap, 55 points. Merrick Garland in 2016 had the third-widest, 44 points. Miers in 2005 had the smallest gap: 48 percent of Republicans supported her appointment, while 24 percent of Democrats did. This reinforces the argument that Miers isn’t a good parallel for Kavanaugh, as their opposition hailed from different camps. Despite their similar polling numbers, if Kavanaugh fails to be confirmed, it won’t be for the same reason Miers did. Gallup’s polling over time carries a similar takeaway, but there’s a subtle difference. Members of the president’s party have tended to support his Supreme Court nominee at consistent levels over the years. For example, Republicans told Gallup they support Kavanaugh 76 percent to 9 percent; in 2005, they said they supported Roberts 82 percent to 5 percent. But the out-party has grown increasingly close-minded to nominees of presidents of the opposing party. Democrats today oppose Kavanaugh’s confirmation 67 percent to 14 percent, a far cry from 2005, when they supported Roberts’s confirmation 42 percent to 35 percent. That shift by the opposition party has led to an increasing gap between Democrats’ and Republicans’ net support for Supreme Court nominees in Gallup polling since the 1990s and 2000s. In the past, yes, it’s true that public opinion has been a pretty good indicator of which way the wind is blowing in the Senate. But if Americans are “sorting” their opinions on Supreme Court confirmations according to which party they belong to, the era of broadly popular Supreme Court nominees may be over. And a nominee with an evenly divided net confirmation rating may not be as imperiled in the Senate as he used to be — as long as his party is behind him. CORRECTION (July 18, 2018, 3:55 p.m.): A previous version of this article incorrectly described polling on Harriet Miers. Pew found that 24 percent of Democrats supported her confirmation, not that 24 percent of Republicans opposed it. Compared to Fox News’s first poll of each past nominee. Everyone from John Roberts through Kavanaugh, except Merrick Garland. All of them except Stephen Breyer, Anthony Kennedy and David Souter. We are counting independents as part of the party they caucus with.